If you work in the publishing industry, you will know how demanding the workload can be. Your time is worth a lot of money, and you certainly shouldn’t waste it. Online tools can help you to improve productivity. From veteran editors to influential bloggers, they all have one thing in common. Productivity. Most writers in top publishing sites will be experts at time management, in addition to being extremely efficient with their writing. To manage their workload, even the best in the industry need some help. We once wrote a post on the most Surprising Content Marketing Tools to Help You Work Smarter, so to add to that article here are 5 different tools that can maximize your teams writing potential and create more engaging content in a competitive publishing business. There is not one top publisher that can maintain their reputation without a content calendar. When you want to scale your articles and bring in more traffic, you will need to have one at hand. Co-schedule is one of the best tools for tracking your content for the entire year and helps you see where there are gaps to fill. 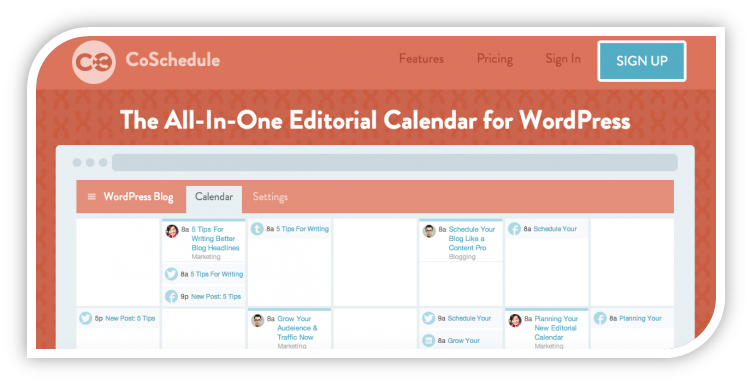 It works not only as a content calendar, but also as a social media planner and workflow management tool. Productivity Benefit: When using a content calendar you will be able to plan articles that complement each other and allow you to create a back link system to older posts on your site. This is a great way of improving your SEO and increasing readers trust in your expertise of a subject. Hitting two birds with one stone. If it’s good enough for The Next Web, you should also consider it. Encouraging your writers to use bookmarking tools is a good way to help them save ideas for later. Instead of spending those two hours researching topics, Pocket does the leg work for you. 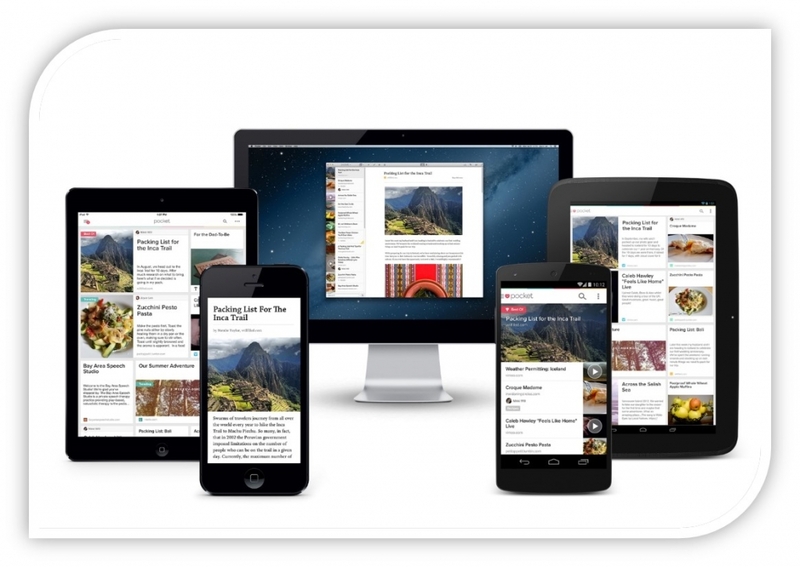 Pocket is a great option for publishing teams because it can also integrate with other apps such as Flipboard, Twitter and feedly. Productivity Benefit: One of my favorite tools is feedly and in my opinion is one of the best places to start ‘pocketing’ articles that can help build the background for your next piece of content. If you are on the feedly Pro package, they are now offering a shared collections feature which will help you share interesting articles with your colleagues and keep everyone in the loop with the latest news. Just check out Guy Kawasaki’s collection; perfect for content marketers. If you want to make your writing more accessible to readers it is a good idea to use this tool as it takes chunks of texts and finds opportunities to simplify it. It can even show you at what readability age your writing is. As you probably already know, producing engaging content is the best way to succeed in the competitive publishing world. 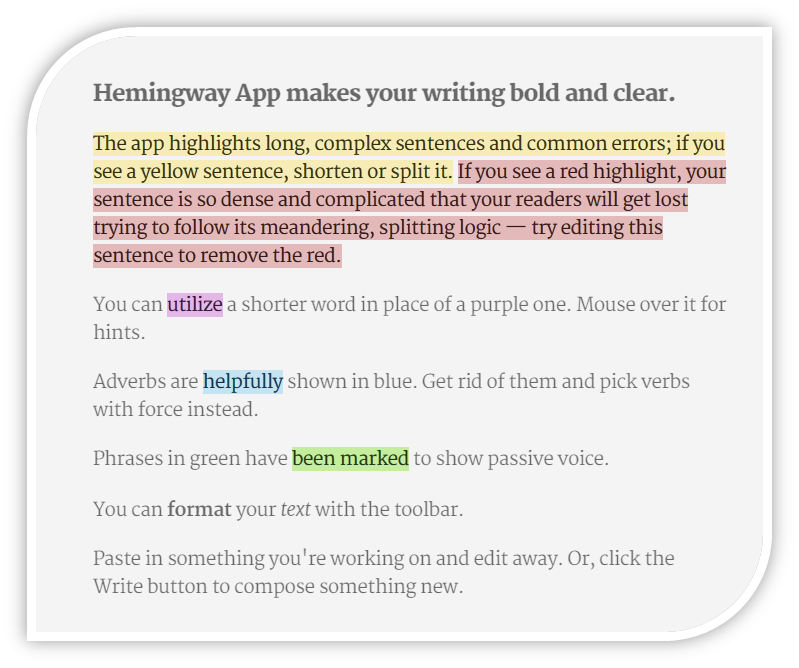 Productivity Benefit: If you have writers that edit their work over and over again, this tool will help them save time. Even for the best writers in the industry, this tool can really refine your content and make your readers want to come back for more. One of the most time consuming parts of writing and publishing is not the actual content creation, but the formatting that happens when you paste your post into WordPress. Generally, most people use Word or Google Docs to write their posts and as you probably know this format does not always match WordPress, leaving you to reformat everything from scratch. Even though you might not think 20 minutes a day is that much, but it actually adds up to 86 hours a year wasted on formatting. 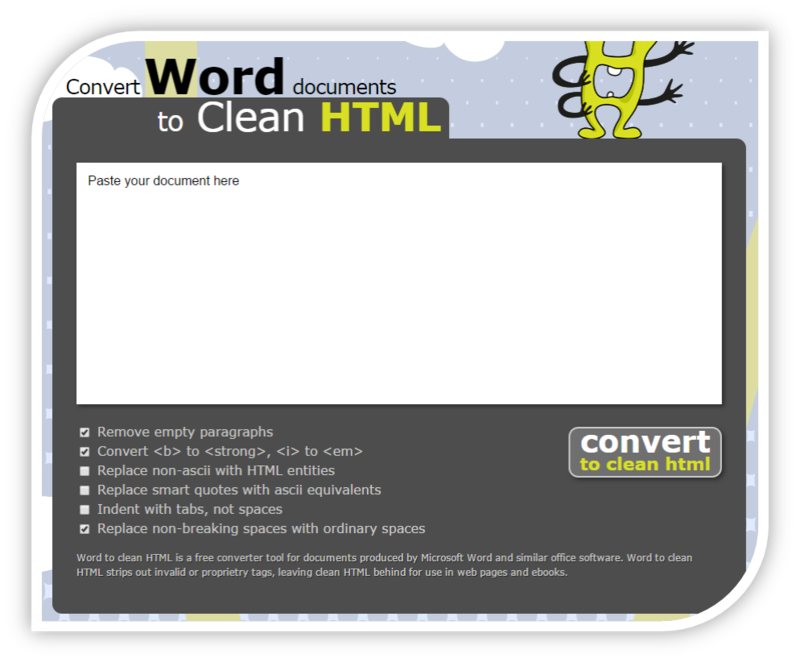 Word2cleanhtml will generate a clean HTML code so that your writers can just copy paste the clean code into WordPress and not worry about the format jumping around. Productivity Benefit: Save your team 86 hours a year on formatting with this free tool. Now if that’s not productive, I don’t know what is. For simple project management, this is one of the best online tools out there. Of course most online publishers find great benefits from CRM’s such as Salesforce, but you can think of Trello as your shared electronic sticky notes organizer. One of the best parts about Trello is that it can keep your creativity ideas on track. It has a smooth user face that allows you to move ‘cards’ when you finish a particular task and streamline your productivity. If your company works with freelancers it is also a useful way making sure their jobs are on time. In addition, the shared aspect enables your creative team members to share, comment and brainstorm on ideas together. This is extremely useful for teams that that like to work in collaboration to each other. 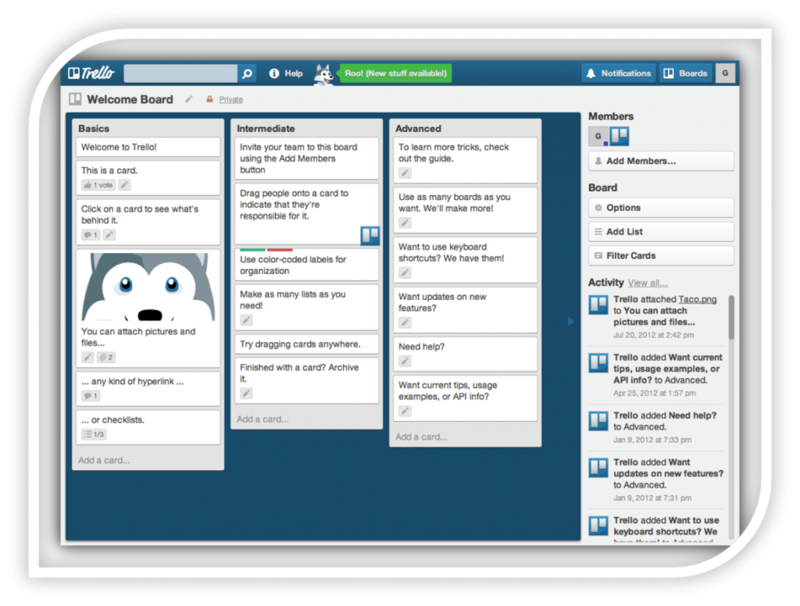 Productivity Benefit: Trello is a great option as a free project management tool, though for bigger businesses you will need to invest in some of its premium features such as integration with Evernote, MailChimp, Hubspot and more, as well as having larger file attachments and added security measures. 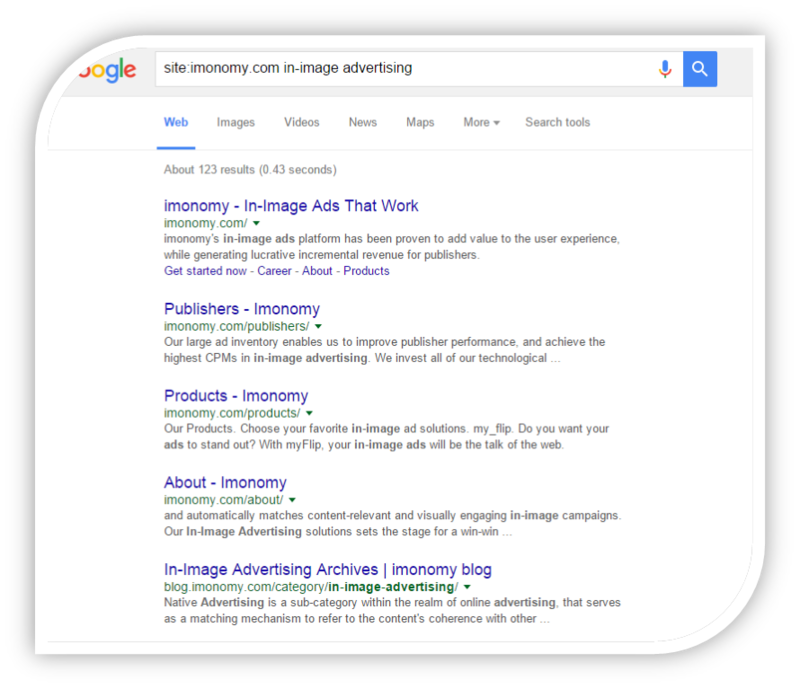 This cool Google search hack is one of my favorite online tools, and is really useful when planning out your posts. Instead of browsing an entire site for relevant content, you can do a site:search on Google to fast forward the process. Walla! You have all of the mentions of that key term from that website. This is a very handy method of finding statistics and quotes that could be useful for your next article. Productivity Benefit: Your team of writers might not know about this hack, and could save them a lot of time in topic research. So what is the conclusion for being a more productive team? In my opinion, when you use tools that match your writing needs, your output will be much more efficient. As the saying goes, it’s hard to teach an old dog new tricks, so many teams need a lot of encouragement and guidance if new tools are expected to be used. But with a good implementation and training strategy, these tools have the potential to really help online publishers reach their content strategy plan with much more ease. What tools are you using to maximize your writing efficiency? Would love to hear about those that I left out!